There is prize for developing the longest-lived mouse in the world. It was set up in 2003 and the first award went to Dr Bartke. "On June 8th, 2003, the inaugural Methuselah Prize was awarded to Dr. Andrzej Bartke for the "Methuselah Mouse" that lived the equivalent of 180 human years". Life extension in the dwarf mouse. It's now 2018 and no one appears to have improved on the Laron mouse model which won that initial prize. Over the last 15 years there has been a lot of interesting research but no numerical progress. I think it is worth noting that Laron mice are not GH deficient, they have tons of the stuff. They simply do not have the receptor to do anything with it. Which, in particular, means they cannot generate IGF-1. *Dr Laron has reported two cases of Laron Syndrome people developing diabetes (and there are others), including the complications such as atherosclerosis, renal disease and diabetic retinopathy. This is an interesting observation and might be worth a post on its own some time. Do deficiencies in growth hormone and insulin-like growth factor-1 (IGF-1) shorten or prolong longevity? They have a mutation which causes multiple pituitary hormone deficits, ACTH secretion excepted. There are too few documented people with this genetic problem to say a great deal about longevity but ages of 68, 77, 83 and 91 years have been recorded in the four individuals to have died since detailed observations began. The equivalent syndrome in mice under lab conditions promotes longevity. It found, as you might expect, an inverse relationship between height at enrolment and longevity. They also tied the relationship, observationally, to a down-regulating SNP of the FOXO3 gene, FOXO genes being major controllers of the insulin/IGF-1 signalling system. "The present data indicate that the increase in IGF-1 is the result of the increase in protein content. The further decrease in carbohydrate did not result in a further increase in IGF-1. In fact, the increase was approximately the same (138% and 136%, respectively)". What interested me initially (and had made me chase the paper) was the effect on GH itself. The LoBAG diet actually drops GH levels, admittedly by a ns amount. What turns out to be a much more interesting incidental finding is that, despite the downward trend in GH, IGF-1 rises by a statistically significantly and possibly by a biologically significant amount. Especially when you consider a whole slew of cancers sprout IGF-1 receptors on their surface. Brief aside. You have to be very careful with GH and IGF-1 levels in papers like this one as both hormones come with a whole load of plasma binding proteins which very few people, including the LoBAG folks, ever measure. These may well alter the effective concentration of the hormone either upwards or downwards. Caution is needed with simple measurements like those in this paper. End aside. i came across this recently A High Fat Diet and NAD+ Rescue Premature Aging in Cockayne Syndrome https://www.ncbi.nlm.nih.gov/pmc/articles/PMC4261735/ Cockayne syndrome people have mutations in the genes encoding the DNA repair proteins CSA or CSB and so age faster. Across multiple cell lines, including human cells, it appears that "decreased SIRT1 activity and mitochondrial dysfunction" is at the heart of this accelerated aging disease. "Findings in several species have linked endocrine signaling to life span. For example, mutations in many genes of the insulin/IGF-I signaling pathway affect life span in lower eukaryotic organisms (186). Similarly, decreases in IGF-I and insulin signaling prolong life span in mice (187). Interestingly, NAD?-dependent enzymes such as sirtuins are known to influence insulin and IGF-I signaling. The activity of SIRT1 orthologs in different species influences the insulin/IGF signaling pathway at di- verse steps (63, 188). In addition, SIRT1 might participate in the regulation of insulin and IGF release (36, 110). Of note, SIRT1-knockout mice are rarely born, but when they are, they overexpress IGF-binding protein-1, which decreases the free levels of IGF-I, rendering a dwarf phenotype. Remarkably, another sirtuin, SIRT6, may also de- termine serum IGF-I levels (124), although the molecular link between these observations is not clear. It must be mentioned that SIRT1 and SIRT6 knockout mice present multiple abnormalities, which can explain their reduced life span and why reduced IGF-I levels do not promote longevity in this model. In general, the effects of SIRT1 activation have a tendency to oppose those of IGF on longevity, although in the long term or in insulin-resistant states, they might both favor insulin sensitivity through repression of PTP1b (189). It is particularly relevant that sirtuin activity influences FOXO transcriptional activity, which is another evolutionary conserved player in the regulation of life span (190). 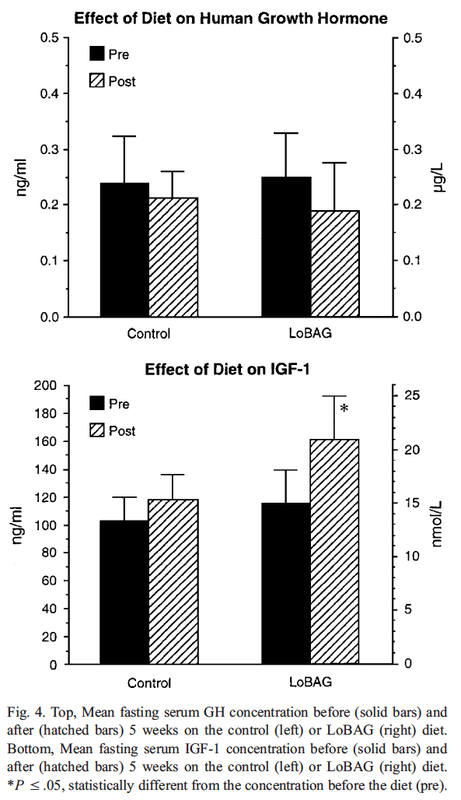 Insulin/IGF-I negatively regulate FOXO activity through Akt-mediated phosphorylation. Deacetylation ofFOXOby sirtuins seems to contribute to target-gene specification and may inhibit insulin-stimulated FOXO1 phosphorylation. Interestingly, insulin/ IGF-I action generally increases glycolysis in cells, which should theoretically decrease the NAD+/NADH ratio and, therefore, shut down sirtuin activity. Consequently, it seems likely that SIRT1 and insulin/IGF-I actions negatively regulate each other"
And the concept of the NAD+/NADH ratio controlling lifespan harks back to Abraham Hoffer and niacin supplementation as a cancer prophylaxis. You can look at it as a technique to slow ageing rather than a specific antineoplastic maneuevre. Interesting subject. Nice post, I've been thinking about the same thing. So my theory, with absolutely no evidence, is that IGF-1 (and possibly other growth pathways associated with it) regulates membrane fatty acid composition, in the direction of more PUFA and less saturated fats. This would explain the life extension in mice nicely. Regardless of whether my out there theory is correct, what's more interesting is that eating a diet high in saturated fat and low in everything else (such as yours) causes 1) low insulin 2) cells resistant to the effects of insulin, meaning low IGF-1 and other assorted growth factors associated with it. Peter, one of the original LC writers before meat diet and cutting out everything else "toxic" became default. One of the most perplexing things to my understanding of available info is why people in favor of the muscle meat based diet assume it will have any of the benefits of the ketogenic diet? I see ppl extrapolating ketogenic research as an argument for eating 100% meat. A very high protein diet is often not even ketogenic, and protein as a nutrient has far more in common with glucose than fatty acids. In fact, perhaps protein can be considered even more insulin pathway amplifying due to the unique igf-1 piece, mTOR, on top of its glucose redundant insulin production. I remain a stan for the fat based low carb diet for this reason. My perspective with protein is the reasonable middle. Protein restriction becomes increasingly risky in advanced age. Even if hypothetical longevity benefits pan out in humans, risk of accidental death from falls or infections are likely greater in individuals running low protein levels with weaker bones (igf1 and protein being important here). OTOH the current low carb trend to consider 1g/lb body wt your minimum is likely unwise from a long term prospective as well, considering longevity and cancer resistance likely hinges upon low IGF1 levels. So the "safe" bet is a normal or high normal protein and the balance of dietary calories from fats as much as possible while on a low carb diet. I like to run at 80g for my bodyweight of 125, which is high normal, but considerably less than most "low carb" dieters eating excessive meats. For what its worth i seem to look fairly youthful @ 35 years old, following the diet for 15 or so. Some of my protein is plant based/incomplete which is not quite as igf-1 ratcheting as pure animal protein is as well (although i always make sure my diet has at least my minimum protein requirements from animal sources). I really do worry about these low carbers eating super high animal protein diets. The evidence we have, that exists, suggests this to be an unwise long term decision. Wooo, I probably run between 80 and 100g/day. The science pushes me towards this or lower but you have to worry about those Laron Syndrome peeps and their high rate of accidental death. Life is not lived in a mouse cage! Birthday next month, 62, heading for a family outing to the climbing walls in Norwich. Best I can do in the flatland of Norfolk!!!! I miss Scotland a little, though Norfolk is pretty cool. Have recently started reading your blog again after a long hiatus. Used to read you in 2008-10. 80-100 g of protein?? I thought you used to eat only 60 g/d and warned about protein creep? Have you succumbed to it or the danger of protein creep is now not so much? Gyan, yes, protein creep is very easy. I think I also spend a great deal more time in ketosis than I used to too. Reverse carb creep I think. Plus if I get out on the pushbike the level of exercise produces a marked spike in ketones. Interesting in rodents on a LC non ketogenic diet GH parallels protein. So I'd rather aim a little lower on protein. However this paper by Bielohuby: "Lack of Dietary Carbohydrates Induces Hepatic Growth Hormone (GH) Resistance in Rats" is interesting from the point of view of both drifts. Kwasniewski considers that protein overload is worse than carb excess. I think that, personally, I might drift my protein intake a little downwards..... I weigh essentially nothing still, just have a concept in mind of avoiding excess meat and choosing high fat to protein cheeses etc. Might be interesting to see what my vague macros work out at nowadays. So you do eat cheese. Cheese is very convenient for a chiefly lacto-ovo person attempting a reduced carb diet but I am concerned about its insulin-provoking potential. I suppose you steadily maintain the very low-carb throughout. But doesn't that impair metabolic flexibility somewhat? Surely hunter-gatherers or other paleos must have enjoyed high-carb diet during certain periods? Due to cultural reasons, we have fasting periods which are necessarily high-carb. I think this feature must present certain advantages and mimic the hunter-gatherer pattern of seasonal variation. That would be fatal if you took fasting to an extreme, not grain avoidance. Obviously no one ever died of hearthealthywholegrain deficiency. Yes. In one of the dwarf studies murder featured as a cause of death...... I guess not too common in lab rats. BTW, would that be 0.6g/kg/day from Rosedale? I just wish that he (Rosedale) hadn't gone in to oxygen toxicity as a selection pressure when photosynthesis evolved, in one of his videos on Youtube. Nick Lane sees no suggestion of a cataclysmic event with rising atmospheric O2 levels. The ability to cope with oxidative stress is intrinsic to life, long before gross oxygen arrived on the earth... Maybe we should send Dr Rosedale a copy of Oxygen????? yep. sorry. Bad typing, .6g/kg/day. Interesting, Peter and Wooo running at 1.3/1.4 g/kg, both more than double the Rosedale number. I'm also a bit surprised to see your number Peter, I always did believe you were in ketosis a lot of the time, your diet seemed to make that obvious, but I thought you targeted (and ate) 1g/kg protein or less. How about when dieting, is it ok/a good idea to eat more protein when trying to lose weight, e.g. 0/500/1000 calorie days? (assuming 2000/day for maintenance).